Do the saints, whom we call upon, pray for us? They certainly pray for us. If I, a sinful man, a cold-hearted, sometimes wicked and malevolently disposed man, praying for others who have instructed or have not instructed me to pray for them and do not doubt, do not weary of saying their names during prayer, although sometimes not heartily, then will not God's saints — those lamps and torches, burning in God and before God, full of love to their earthly brethren — pray for me and for us when we call upon them with faith, hope, and love, according to our strength? They, our speedy helpers, pray also for our souls, as our Divinely-enlightened mother, the Holy Church, assures us. Pray, therefore, undoubtingly to God's saints, asking their intercession before God on your behalf. They hear you in the Holy Spirit; only pray in the Holy Spirit, from your soul for when you thus sincerely pray, then the Holy Spirit breathes in you, Who is the Spirit of truth and sincerity, and is our truth and sincerity. The one same Holy Spirit is in us and in the saints. The saints are holy through the Holy Spirit, Who sanctifies them and eternally dwells in them.How vividly God's Saints represented God to themselves! — the Saints who through the Holy Spirit compiled prayers for their own and our guidance. In what fear and trembling they stood before God in prayer, but also with what love and hope! Every word of their prayers says: "God is with us; and God within us hears each of our words, sees every thought, every wish, every tear. "When we call upon the Saints in prayer, if we pronounce their names from the heart, it already means that we bring them near our heart itself. Therefore ask their prayers and intercession undoubtingly for yourself. They will hear you, and will speedily lay your prayers before the Lord, in the twinkling of an eye, for He is omnipresent and omniscient. When the Oblation you call in prayer upon the Lord Jesus Christ, or upon His Most pure Mother and the Saints, or when you commemorate the living or the departed, then the portion taken from the Bread, that has been offered, represents, and as if replaces by itself the Lord, or His Most-pure Mother, or some particular Saint, or many Saints conjointly; also the living or the departed commemorated, while the name thought of represents and replaces by itself the soul of the being invoked or commemorated. Thus, in a small form, on our lips and in our hearts, the beings of the higher and lower worlds are reflected, and all this through faith, by the Holy Spirit, who alone is being everywhere and filling everything. 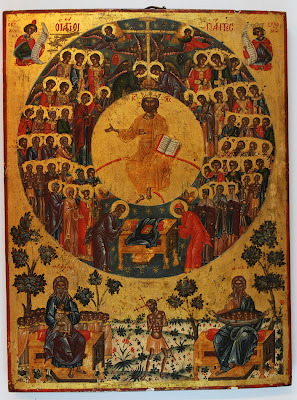 At the end of your morning and evening prayers in your home, call upon the Saints: Patriarchs, Prophets, Apostles, Prelates, Martyrs, Confessors, Holy Fathers, the Ascetics, the Unmercenary, so that seeing in them the realisation of every virtue, you may yourself become the imitator of every virtue. Learn from the Patriarchs childlike faith and obedience to the Lord; from the Prophets and Apostles, the zeal for God's glory and for the salvation of the souls of men; from the Prelates, zeal to preach God's word, and in general to assist through the Scriptures, to the possible glorification of God's name, to the strengthening of faith, hope, and love amongst Christians; from the Martyrs and Confessors, firmness for the faith and piety before unbelieving and godless people; from the Ascetics, to crucify your own flesh, with its passions and desires, to pray and think piously; and from the Unmercenary, not to love gain, and to give gratuitous help to the needy.God's Saints are represented in their inward actions as listening to the inward Guest, Who works within them — the Lord — venerating Him, smiling from inward sweetness and tenderness, and enjoying heavenly rest. "Ye are now returned unto the Shepherd and Bishop of your souls. "God's saints had "the eyes of their understanding enlightened," and with these eyes they clearly saw the wants of our sin-corrupted nature; clearly saw for what we should pray, for what we should ask, for what we should give thanks, how we should praise the Lord, and they left us the most perfect examples of prayers of various kinds. O, how beautiful these prayers are!If, being in an assemblage of men, you call a person known to you, and he comes to you; if you ask one or many men subservient to you to do anything for you within the limit of his or their capability, and they fulfil your request, satisfying it according to your desire, and even beyond your desire, then be assured that, likewise, in God's Church, in that great house of God divided into two halves — the heavenly and the earthly — any of the members of the Church in Heaven whom you call upon will come to your spiritual help conformably to his grace and the abundance of his love. Ask him to do anything for you that you please, especially anything relating to the Kingdom and righteousness of God, and he will do it through his close association with God, the Source of grace and power. God's saints also hear you — as, for instance, the whole congregation hears you when you pray or speak the Word — for they are in the Holy Spirit, and the Spirit is everywhere present, and fills all things.All the Saints in heaven and all true Christians upon earth are "one body and one spirit," this is why the prayer of believers is heard so easily and speedily and truly in heaven, and why there is so much hopefulness in calling upon the Saints; but in order that our prayers should be always easily and speedily heard by the Saints, we must have the same spirit as them, the spirit of faith and of love for God and our neighbour, the spirit of meekness, humility, abstinence, purity and chastity, brave, valiant, thirsting after righteousness, the spirit of compassion, heavenly and not earthly.As a passionate man is one spirit with the Devil — -and this I and many others feel and experience — so a virtuous man is and remains one spirit with the Lord, and this he feels and experiences, saying: "I live, yet not I, but Christ liveth in me"; or, as it has been said by the Lord himself: "He that eateth My flesh and drinketh My blood dwelleth in me, and I in him"; or, again, as the Apostle said: " Know ye not your own selves, how that Jesus Christ is in you?" Thus God's saints are one spirit with the Lord; likewise all those who live piously upon earth. This is a great mystery and a great honour for earthborn creatures. But, also, what shame and destruction it is to the sophistical and disobedient! They are one spirit with the Devil, from whom, Christ our God, deliver us all!As in the earthly life there are poor and rich, so also in the spiritual life", in the spiritual order, there are also poor and rich. As the poor ask charity of the rich and well-to-do, and cannot live without their help, so also in the spiritual order the poor must have recourse to the spiritually rich. We are the spiritually poor, whilst the saints, or those who shine even in this present life by their faith and piety, are the spiritually rich. It is to them that we needy ones must have recourse. We must beg for their prayers that they may help us to become simple as infants; that they may teach us spiritual wisdom, how to conquer sins, how to love God and our neighbour. 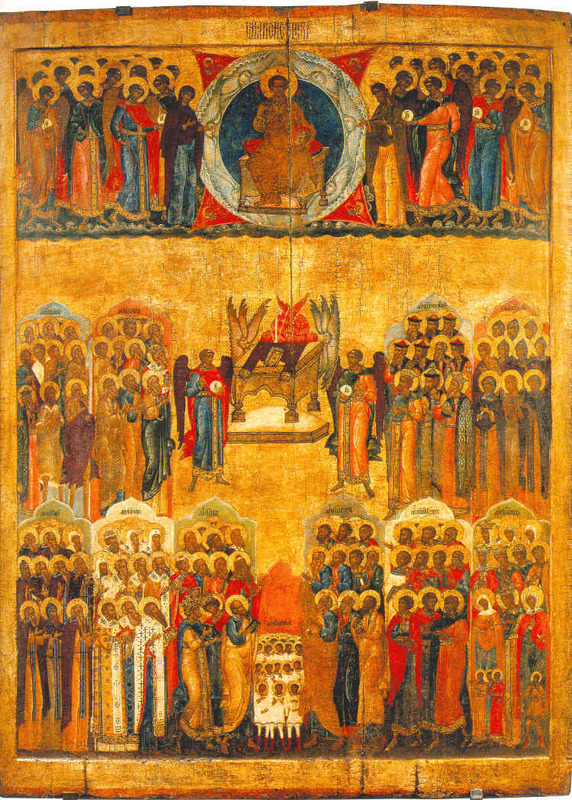 And therefore pray for me, saints of God — prophets, apostles, martyrs, prelates, venerable and righteous men — that I may become like unto you!God's Saints are great through their spiritual disposition, through their faith, their firm trust in God, and their burning love to God, for Whose sake they despised all earthly things. O, how null we are, compared to them; how unlike unto them! They are great by their great deeds of abstinence, vigilance, fasting, unceasing prayers, their diligence in studying the Word of God, and in pious meditation. O, how unlike we are to them! How deeply we must venerate them! With what reverence we must ask for their prayers for us! But in no case must we regard them lightly, irreverently, remembering their godliness and their union with the Godhead.God's Saints are — beautiful, incorruptible, fragrant flowers. Do not touch these flowers with lips defiled by sins — that is, pray to them with a pure heart and pure lips, not carelessly, not with distracted thoughts, but with reverence, and without haste. They are speaking heavens; they led a heavenly, wonderful life on earth, doing great deeds, they lived in great love, in deep humility, gentleness, patience, self-denial, loving God above all things.How worthily reverenced and loved should the temple of God be! How God's Saints loved it!How fragrant are the bones of the Saints! What a wonderful perfume the relics of God's Saints emit! What a great blessing it is to gain the sweet-smelling grace of the Holy Spirit and the life eternal! Why do we run after corruption? Why have we loved the stink of sins, of poisonous passions?Lord in our prayers to Thee, we ask the intercession of the Saints, these spiritual sweet scents, that fragrance of Thy perfumes! Accept their prayers for us, fragrant with love and purity, and save us from the evil odour of sins, for our hearts are unclean and our mouths impure, and we are unworthy of most sweet converse with Thee. Everything in us is — earthly, corrupt, impure, and evil, whilst they, Thy Saints, are the purest fragrance; and, above all, Thy Most Pure Mother, Thy living, light-bearing abode, She is purer than all the brightness of the sun, more fragrant than all perfumes, for heaven and earth are full of the fragrance of Her holiness and of Her Divine virtues.If we call upon the saints with faith and love, then they will immediately hear us. The faith is the connecting element on our part, and love on theirs, as well as ours; for they are in God, and we are in God, Who is Love. When your faith in the Lord, either during your life and prosperity, or in the time of sickness and at the moment of quitting this life, grows weak, grows dim from worldly vanity or through illness, and from the terrors and darkness of death, then look with the mental eyes of your heart upon the companies of our forefathers, the patriarchs, prophets, and righteous ones — St. Simeon, who took the Lord up in his arms, Job, Anna the Prophetess, and others; the Apostles, prelates, venerable Fathers, martyrs, the disinterested, the righteous, and all the saints. 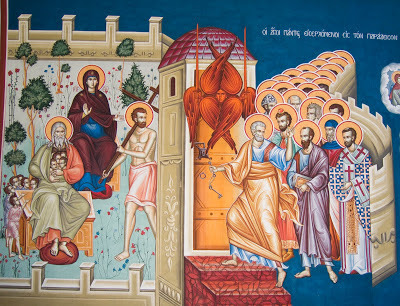 See how, both during their earthly life and at the time of their departure from this life, they unceasingly looked to God and died in the hope of the resurrection and of the life eternal, and strive to imitate them. These living examples, which are so numerous, are capable to strengthen the wavering faith of every Christian in the Lord and in the future life. Those Christian communions who do not venerate the saints and do not call upon them in prayer lose much in piety and in Christian hope. They deprive themselves of the great strengthening of their faith by the examples of men like unto themselves.Live as the saints lived: by their prayers, wisdom, and virtues; in meekness, humility, and gentleness, not sparing yourself, but renouncing yourself, your rest, ease and enjoyment, for the love of God and your neighbour, in patience, courage and struggle — have their faith, hope and love. "Let your loins be girded about, and your lights burning; and ye yourselves like unto men that wait for their lord, when he will return from the wedding. 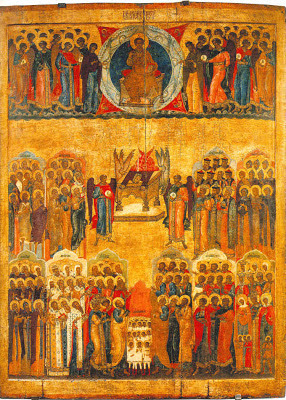 "I gaze upon the icons in the temple — upon Thy holy icon, my Lord, upon that of Thy Most Pure Mother, those of the holy Angels and Archangels, and upon the faces of the saints, adorned, resplendent with gold and silver — and think to myself how Thou hast honoured and adorned our nature, Creator and Provider of all! Thy saints shine with Thy light, they are sanctified by Thy grace, having conquered sin and washed away the sinful impurities of body and spirit ; they are glorious with Thy glory, they are incorruptible through Thine incorruptibility. Glory to Thee for having so honoured, enlightened, and raised our nature! 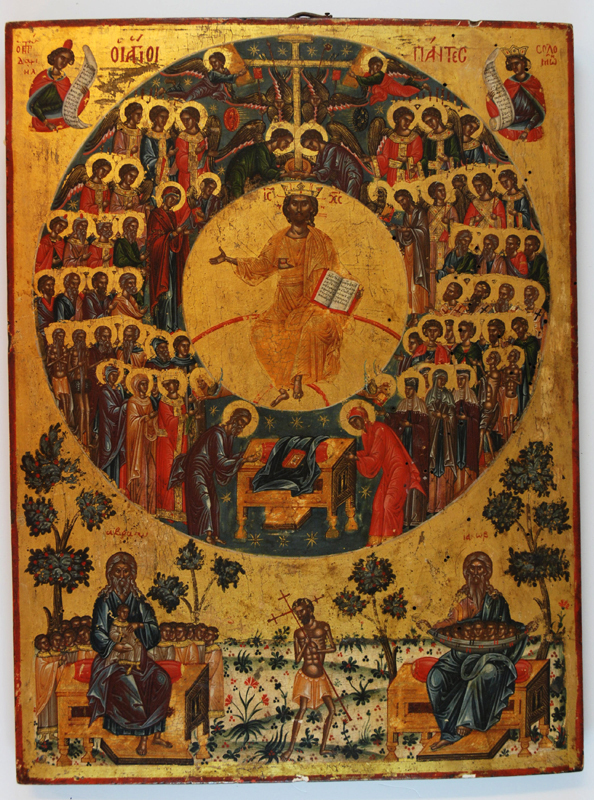 Here are Thine Apostles and Hierarchs, living images of Thee, the Highest, Who passed through the heavens, Envoy of the Father, Hierarch and Chief of Shepherds; Thy goodness, Thy wisdom, Thy might, spiritual beauty, power, and holiness shine in them. Here are Thy martyrs, who by Thy strength overcame terrible temptations and endured fearful tortures; they have washed the garments of their souls white in Thy blood. Here are Thy venerable ones, who by fasting, vigilance, and prayer obtained Thy wonderful gifts, the gifts of healing, of discernment; Thy might strengthened them to stand above sin and all the snares of the Devil; Thy likeness shines forth in them like the sun.The holy Angels and God's saints are our best, kindest, and truest brothers and friends, so often helping us in various circumstances in which no human beings can help us. As these brothers, who eternally live and load us with benefits, are invisible, whilst we, on account of our corporality, wish to have them before our eyes and as though always present with us, therefore we have images of them; and, looking upon these images, we represent to ourselves that they are with us, and we call upon them in our prayers, knowing that they have great boldness before God and help us in various circumstances. 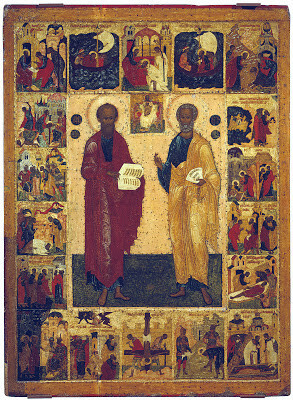 Thus the veneration of icons is most beneficial for us, corresponding with our nature and with common-sense, as well as with the Holy Scriptures themselves, for there were images of the Cherubim in Moses' tabernacle of the Old Testament. Icons serve as a constant reminder to us that the Lord is always with us ("I am with you alway, even unto the end of the world" ); that the Most Holy Mother of God is always near us as the "First-Origin of the spiritual renovation" of the Church, as the Mother by grace of all true Christians. And therefore all true Christians have in their houses the image of the Mother of God, their Queen and Mother by grace, and abundantly, worthily, and rightly adorn it with silver, gold, and precious stones; for, after God, there is no one dearer and more reverenced by them than His Most Pure Mother. Both the Lord Himself and His Most Pure Mother continually prove to us by means of miracles, both inwardly and outwardly, that our true veneration of His saints, and of His Mother, and of His holy icons, is pleasing to Him and profitable to us in the highest degree.Our Lady, the Mother of God, the Angels and all the Saints are as near to me when I call upon them with a pure, whole heart as my own soul, and hear me, as I hear myself: for we are all — one body, one spirit, one Church of Angels and men. The members of the Church have the same relation to each other as the members of the body: they serve each other, they help each other, support and save each other. (But is it thus with the Protestants? )...By calling upon the names of God's saints in prayer, we move them to pray for us.How do the saints hear us? They hear us as being one in the Holy Spirit with us — "that they also may be one in us," as members of the one Church of God, having for her head the one Christ, and animated by the one Spirit of God. The saints see and hear us in the Holy Spirit in the same manner as we see and hear with our bodily eyes and ears by means of light and air; but our bodily sight and hearing are very imperfect in comparison to spiritual sight and hearing. At a great distance we cannot see many objects and cannot hear many sounds, but spiritual sight and hearing are perfect; not a single movement of the heart, not a single thought, not a single word, intention, or desire escapes them, because the Spirit of God — in Whom the saints dwell, see, and hear us — is all-perfect, omniscient, all-seeing, and all-hearing, for He is omnipresent. "As Thou, Father, art in Me, and I in Thee, that they also may be one in Us." This is the reason why we must pray to the Saints: they are in God, and God is in them; and this is why they hear us, that is, owing to their being in the omnipresent God. "For holy art Thou, O our God, and Thou restest in the Saints. "As by means of the electric telegraph we speedily communicate with persons who are far away from us, so, likewise, by means of lively faith, as though through the telegraph wires, we speedily communicate with God, with the Angels and Saints. As we entirely trust to the speed of the electric current, and to its reaching its destination, so, likewise, we should completely trust to the speed of the prayer of faith and to its reaching its destination. Send your petition to God and the Saints by means of the telegraph of faith, and you will speedily obtain an answer. The answering signs of a telegraph are simple, but the experienced read them; the actions upon the heart of the God of all spirits, of all flesh and of the Saints, are likewise simple, but the experienced understand them.As our Creator and God is one, therefore He brings together and unites all things, and, for a believing soul, there is nothing far away that He cannot bring near by means of faith. Do you wish to converse with — -not to speak of God, Who is everywhere, but with the high and heavenly powers, principalities, archangels and angels? You can do so. In accordance with your prayer they will instruct, enlighten, strengthen you in your faith. Or do you wish to converse with the departed Saints? You can do so. They will be with you at your first heartfelt call — especially the most Holy Virgin, Mother of God, our most speedy Mediatrix. " We unceasingly glorify Thee, O Christ, Who hast indescribably joined the earthly to the heavenly, and hast established one Church for the angels and men." Christ is the head both of angels and men. With such a Head, what then cannot be near to us? And how near to us must the Head Himself be in order to hear us! Experience convinces us that He hears us, as the saints also hear us.The Lord especially highly esteems the works of His hands, gifted with reason and free will, that is, the angels and saints, and works through them for our sanctification and salvation. Therefore do not say: I always have recourse straight to God alone with my needs, with my prayer. It is sometimes also necessary for you to have recourse to the saints as His instruments and organs. 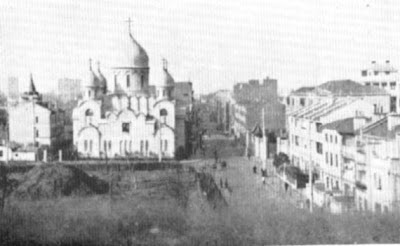 God Himself does not wish that these holy temples of His grace, of His Divine Spirit, should remain inactive in the work of our salvation.If we sinners pray and make supplications to the Lord for ourselves and others; if, when living upon earth, the saints pray for others and ask God for what is needful for them, then much more will they do so when they are transplanted to eternity and are face to face with God. By virtue of the great mediatory sacrifice of the Son of God, the prayers of the saints, especially those of His most pure Mother, possess, by the grace of the Lord Jesus Christ, the power of mediation. This is the Lord's recompense for the merits of the saints.From our own experience of lively, heart-felt prayer, we may know that the saints are received into the closest union with God. Also, by our own experience we know that during our communion with God, by means of the prayer of faith, our mind is enlightened in an extraordinary manner, and acquires the widest scale of action. At this time it sees that which it does not see in its ordinary state. From this, it follows that the saints, being in union with God, being also pure, detached from the body, have the most clear, far-seeing mind. They hear our fervent prayers; and if these prayers are pleasing to God and profitable to us, they will unfailingly fulfil them.God and the saints hear us during our prayer as men hear each other when talking among themselves, or as people standing in church hear the preacher, or soldiers the voice of their commander, with the difference that God and the saints hear our prayers incomparably better and more perfectly, because when we hear the words of an ordinary man we do not know what is in his heart and thoughts, and it may happen that a person, says one thing whilst he has quite another in his heart.But with God and the saints it is not so; they see all that is in our thoughts and in our heart — God Himself by His omniscience, and the saints by the grace of the Holy Spirit, in Whom they eternally rest. They see whether our words really correspond to the feeling of our heart, and if so, and the heart itself on its part is a believing, contrite, and humble one, burning with love and zeal (for " we earnestly have recourse to Thee "), as well as with a desire to obtain what we ask for, then they are favourably inclined to accept our prayer and give us what we desire. God and the saints wish that during our prayer we should represent them to ourselves as living, present with us; that we should see them with our spiritual eyes. God is living. " For He is not a God of the dead, but of the living: for all live unto Him. "As, during a conversation between men, the air, which is everywhere and fills all things, serves as a medium between the word of one and the word of another, and the words of one reach the hearing of another through the air, and it would be impossible to speak and hear without air — so in spiritual respects the Holy Spirit, "Who is everywhere present and filleth all things," is a similar medium in our communion with the bodiless ones. We do not thoroughly understand how, by means of air, our words are heard by others, sometimes at a great distance, yet we know that they are heard; likewise, we do not understand how the holy angels and saints hear, in the Holy Spirit, the wail of our hearts; yet we know that it is heard. As in the first case we may be assured of our words having been heard by others from the answers, so in the latter we are similarly assured by the answers we receive. In the first case we see the person with whom we speak with our bodily eyes, and in the latter we see the person with whom we converse with our spiritual eyes. An image is presented to the bodily eye and to the spiritual eye — an invisible person or spirit. For corporal beings there is distance, whilst for the Holy Spirit it does not exist.Call upon the name of the saint with your whole soul; he will hear you, and will manifest his miraculous power in the image. The name of the Saviour, called upon with faith, works wonders. It drives away the demons, quenches the fire of the passions, heals sicknesses. The names of the saints, called upon with faith, by the grace of God also work wonders. And what is there astonishing in this? They are all in the Spirit of God, and the life-giving Spirit of God is everywhere present and fills all things. The saints all work wonders by the Holy Spirit, because the one Spirit of God is the Spirit of wonders.Concerning honouring and invoking the saints in prayer (on the day of St. Nicholas). What is it founded upon? They are in God; they are rich in spiritual gifts; they are in the land of the living, and in the land of abundance; whilst we are in the land of death and of spiritual hunger. God has taken them unto Himself to preserve our life. " God did send me before you to preserve life," said Joseph to his brethren. Abraham — Noah. The rich man in hell begged Abraham to send Lazarus. Noah, the deliverer from the deluge. "Blessed is he whose race is in Sion, and who hath kinsmen in Jerusalem. 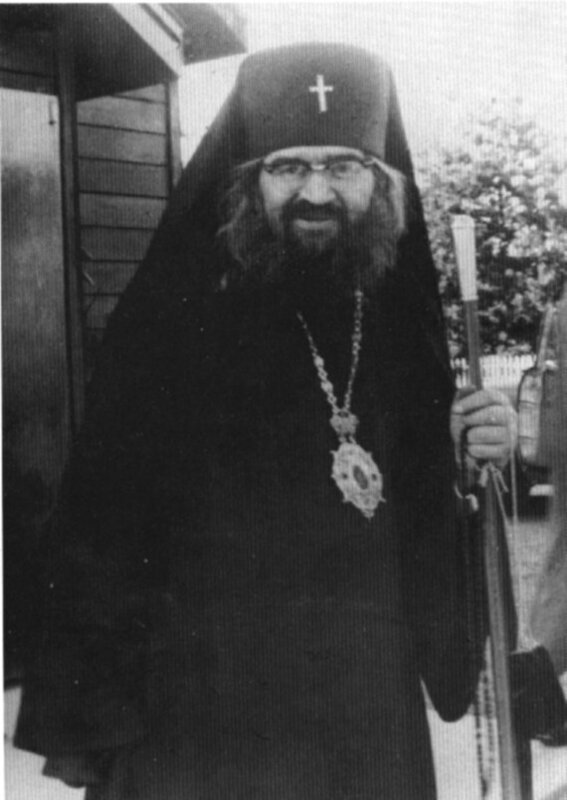 ""O most holy Bishop, Father Nicholas, pray to God for us!" What is the reason that we ask the prayers of the Saints for ourselves? Do they really pray for us? and is their prayer effective? God Himself plainly declared His will to some persons not having nearness to Him, chiefly to sinful men, that they should ask God's people to pray for them. For instance, Abimelech, who took Abraham's wife, was commanded to ask Abraham to pray for him; Job prayed for his friends, in accordance with the evident revelation of God's will; Moses, Samuel, Elijah, and all the prophets prayed; the Lord Himself, in accordance with His human nature, prayed to the Heavenly Father for Peter and for all the disciples. The Saints are worthy of being intercessors for us before God, by their virtues, by their merits, and as those who pleased Him. If earthly justice requires that a certain man nearer to God (for instance, a priest) should pray to God for others, then why should it not be the same in heaven? All the Saints live in God and for us; in God they see our needs, they sympathise with us, they are ready, in accordance with our prayers, to help us. Why in accordance with our prayers, and not otherwise? In order to strengthen us in faith and prayerfulness. Besides, why do even living men wish that others who need their help should ask them for it?What does the daily invocation of the Saints signify — of different ones each day, during the whole year and during our whole lifetime? It signifies that God's Saints, as our brethren, only perfect, live and are near us; that they hear us and are ever ready to help us, by the grace of God. We live together with them — in the one house of the Heavenly Father — only on its different halves. We live on the earthly, they on the heavenly half; but we both have a means of communication with each other: for us the prayer of faith and love, for them their spiritual nature, always ready for active help, owing to the love with which their souls are permeated.The saints fulfilled the word of the Lord; the Lord fulfils their word; they worked for Him — He does so for them. The Lord Himself said: " With what measure ye mete, it shall be measured to you again." This is why the Lord speedily fulfils the prayers of the Saints for us. "My servant Job shall pray for you; Abraham shall pray for thee . . . Moses. . . Samuel . . . Elijah." The prayers of the Saints for us are pleasing unto the Lord, as coming from His faithful servants. The Devil continually lies against God in our hearts, especially in respect to God's omnipresence, saying, "God hath forgotten: He hideth away His face;" also, in respect to His justice, "God careth not for it;" also even, in respect to His existence, "There is no God. "God's saints are great merchants, who have enriched themselves with all spiritual treasures, with all virtues: meekness, humility, abstinence, patience, great faith, hope, and love. This is why we ask their holy prayers, as poor men of rich, that they may help us in our spiritual poverty; that they may teach us how to pray and to progress in all Christian virtues; that they, having boldness before God, may pray for the remission of our past sins and protect us from fresh ones. We go to earthly merchants in their shops to buy their merchandise: shall we not have recourse to the heavenly merchants with fervent prayer, as though with silver and gold? Shall we not purchase of them their intercession for us before God for the forgiveness of sins and the bestowal of various Christian virtues? It seems very natural to do so. "All things are possible to him that believeth," because he who believes is one spirit with the Lord. If everything is possible to the believer who lives on earth, though he isÂ°not quite perfect, then still more is it so to him who dwells in heaven in close union with God, and who is most perfect. To the saints God is everything, so that the saints are truly gods. "I [God Himself, Whose word is truth] have said: Ye are gods. "The priests praying on earth for men are the sign and testimony of the heavenly Church praying for us in Heaven, and of the Mediator Christ God Himself. The Saints are kinder than we think, and more speedily than we think they come to our help, in accordance with our prayer.Do not be afraid of human talk and mockery about yourself. This is diabolical fear; think of what the Lord God says of you, what the angels and saints say of you.Call upon the saints with faith unshamed and love unfeigned if you wish them to hear you and fulfil your prayer. Remember that like seeks after like. The saints have themselves pleased God by their faith and love, and wish to see the same in you. To faith and love add also the reverence due to them.The saints of God live even after their death. Thus, I often hear in church the Mother of God singing her wonderful, heart-penetrating song which she said in the house of her cousin Elizabeth, after the Annunciation of the Archangel. At times, I hear the song of Moses; the song of Zacharias — the father of the Forerunner; that of Hannah, the mother of the prophet Samuel; that of the three children; and that of Miriam. And how many holy singers of the New Testament delight until now the ear of the whole Church of God! And the Divine service itself — the sacraments, the rites? Whose spirit is there, moving and touching our hearts? That of God and of His saints. Here is a proof for you of the immortality of men's souls. 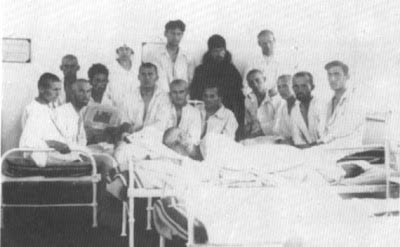 How is it that all these men have died, and yet are governing our lives after their death — they are dead and they still speak, instruct and touch us?Also daily invoke the glorified saints, that they may enlighten your way by their prayers, and that they may intercede for the forgiveness of your sins; and that you yourself may remember that after death there is eternal glorification and bliss for good deeds, and eternal condemnation for evil ones.How is it that the saints see us and our needs and hear our prayers? Let us make the following comparison: Suppose that you were transplanted to the sun and were united to it. The sun lights the whole earth with its rays, it lights every particle of the earth. In these rays you also see the earth, but you are so small in proportion to the sun, that you would form, so to say, but one ray, and there are an infinite number of such rays. By its identity with the sun this ray takes an intimate part in lighting the whole world through the sun. So also the saintly soul, having become united to God, as to its spiritual sun, sees, through the medium of its spiritual sun, which lights the whole universe, all men and the needs of those that pray.Whomsoever you wish to pray to, before praying, first ask in your heart that you may be made worthy of offering Him your heartfelt prayer, praise, or thanksgiving, for we can only pray by the strengthening of the Holy Spirit, and by the strengthening of those saints, through whose intercession we wish to pray to the Saviour. Raise to Him before your prayer or praise a heartfelt voice, that He may grant you the grace of sincere prayer, that He may lay His easy yoke and His light burden on your heart, that they may destroy the diabolical pride and resistance of your mind and heart. If you wish to pray to Our Lady, call upon Her that She may make you worthy of offering Her your prayer, praise, or thanksgiving from the whole heart, unfeignedly. If you wish to pray to an angel, ask the Lord to make you deserving of worthily offering him your prayer, or of hymning the grace, brightness, and goodness of his nature; if to a saint, invoke the Holy Spirit, by Whose holiness the saints are sanctified, that you may worthily call upon him or ascribe praises and thanksgivings to him; for we all can only pray worthily and vivifyingly through the strengthening of the life-giving Holy Spirit. God's saints are the pure breathings of the Holy Spirit. "The wind (the Spirit) bloweth where it listeth." (That is, He breathes in any soul He pleases.) The Holy Virgin was superabundantly sanctified and purified by the Holy Spirit. The angels, too, are sanctified by the Holy Spirit, and live and breathe by Him, as we live by the flesh and breathe by means of air. Prayers, in their true aspect, are nothing else but the breathing of the Holy Spirit. "The Spirit Itself," it is said, "maketh intercession for us with groanings which cannot be uttered." Footnotes Exclamation taken from the Vespers. Note: The Proimion I and the first Oikos below are taken from the link below, while the rest of the text following is an amateur translation from the Greek. O Planter of creation, Lord, to You does the entire world bring as an offering the God-bearing martyr Saints, as being nature’s first fruits. At their earnest entreaty, keep Your Church in a state of profoundest peace, through the Theotokos, O Lord abundantly merciful. Having held it as the type of that above. And they cried out to Christ, “You are my God; preserve me. And have made us participants in the feast. For the things on earth have become heaven. And behold divine and incomprehensible deeds. Cannot be related by word, nor circumscribed by place. For they loved Your Kingdom. And kept in memory the incorruptible things. As lambs torn apart by wolves. The lawless fell upon them. For who would dare to struggle against Your Saints? 12. The devil was struck down, and fell along with all his power. And was unable to hit Your Soldiers. And they struggled according to the rules. And finished the course of the race. To those who need it and entreat You with faith. THE COMMEMORATION of each of the saints on the appointed feastday is an occasion for town and country, citizens and their rulers to share in rejoicing, and brings great benefit to all who celebrate. “The memory of the just is praised”, says the wise Solomon (Prov. 10:7 Lxx), “When the righteous is praised the people will rejoice” (cf. Prov. 29:2 Lxx). If a lamp is lit at night, its light shines for the service and enjoyment of everyone present. Similarly, through such commemorations, each saint’s God-pleasing course, his blessed end, and the grace bestowed on him by God, because of the purity of his life, bring spiritual joy and benefit to the whole congre­gation, like a bright flaming torch set in our midst. When the land bears a good harvest everyone rejoices, not just the farmers (for we all benefit from the earth’s produce); so the fruits which the saints bring forth for God through their virtue delight not only the Husbandman of souls, but all of us, being set before us for the common good and pleasure of our souls. During their earthly lives, all the saints are an incentive to virtue for those who hear and see them with under­standing, for they are human icons of excellence, animated pillars of goodness, and living books, which teach us the way to better things. Afterwards, when they depart this life, the benefit we gain from them is kept alive forever through the remembrance of their virtues. By commemorating their noble deeds, we offer them that praise which, on the one hand, we owe them for the good they did our ancestors, but which, on the other, is also fitting for us at the present time, on account of the help they give us now. 2. When we call to mind what they accomplished, we add nothing to their good deeds. How could we, given that we are not even competent to depict their virtue as it really is? For the sake of the sublime rewards promised by God, they strove honourably to the limit of human nature and showed us a way of life that was equally sublime. We certainly do not augment their treasures by praising them - not at all! But we do increase their bounty to us by looking up towards them as lanterns aglow with divine light, and by understanding better and welcoming the beautifying power which comes from them. 3. 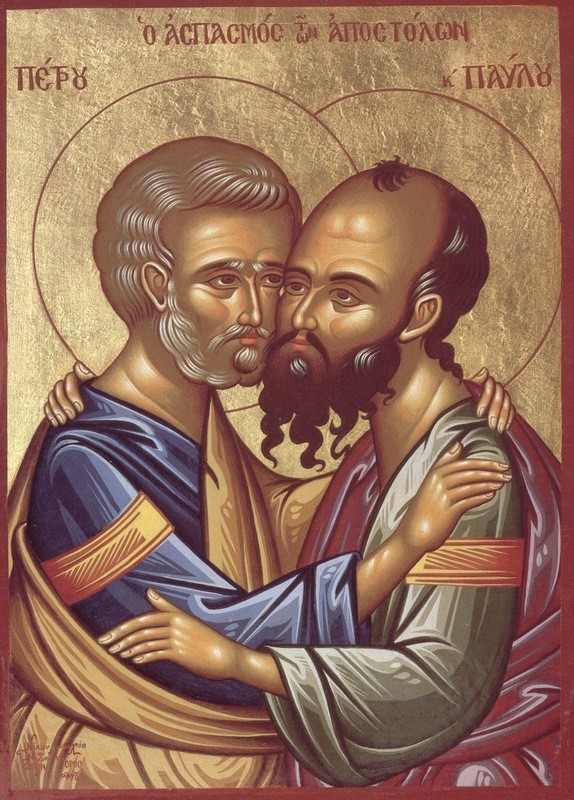 If, as we have said, we commemorate each of the saints with hymns and appropriate songs of praise, how much more should we celebrate the memory of Saints Peter and Paul, the supreme leaders of the pre-eminent company of the apostles? They are the fathers and guides of all Christians: apostles, martyrs, holy ascetics, priests, hierarchs, pastors and teachers. As chief shepherds and master builders of our common godliness and virtue, they tend and teach us all, like lights in the world, holding forth the word of life (Phil. 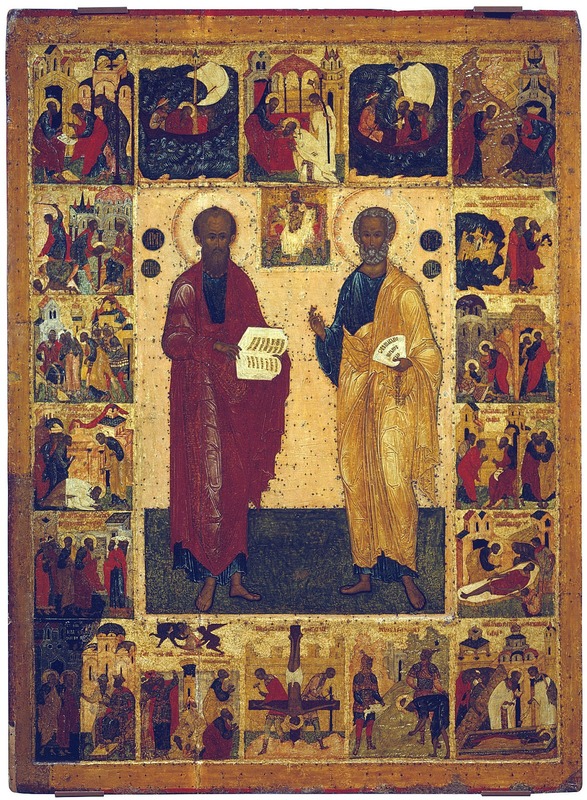 2:15-16). Their bright­ness excels that of the other radiantly pious and virtuous saints as the sun outshines the stars, or as the heavens, which declare the sublime glory of God (cf. Ps. 18:1), transcend the skies. In their order and strength they are greater than the heavens, more beautiful than the stars, and swifter than both, and as regards what lies beyond the realm of the senses, it is they who reveal things which surpass the very heavens themselves and indeed the whole universe, and who make them bright with the light “in which there is no variableness neither shadow of turning” (cf. Jas. 1:17). Not only do they bring people out of darkness into this wonderful light, but by enlightening them they make them light, the offspring of the perfect light, that each of them may shine like the sun (Matt. 13:43), when the author of light, the God-man and Word, appears in glory. 4. The appearance to us this day of both these luminaries together brightens the Church, for their meeting produces a wealth of light, not an eclipse. It is not the case that one has a higher orbit and is placed above, while the other is lower down and passes under his shadow: Nor does one rule the day, the other the night, such that one would overshadow the other if they appeared opposite each other. Light is not produced by one and received by the other in such a way that the latter’s radiance would vary sometimes depending on the distance between them. Rather, both share equally in Christ, the everlasting source of eternal light, and have attained to the same height, glory and radiance. That is why the coming together of these lights signifies their solidarity and support for one another and illuminates the souls of the faithful twice over. 5. The first traitor, who incited the first man to desert God, saw Him Who had earlier made Adam, the father of the human race, later re-creating Peter as the father of all true worshippers. He not only saw; but also heard the Creator saying to Peter: “Thou art Peter, and upon this rock I will build My church” (Matt. 16:18). Once the prince of evil found this out, being the epitome of wicked envy, he tempted Peter, the first leader of God’s faithful people, as he had previously tempted Adam, the founder of the race of men. Realizing that Peter was endowed with intelligence and afire with love for Christ, he did not dare make a direct attack. Instead he came upon him from the right flank, cunningly deceiving him into being excessively eager. At the time of the saving passion, when the Lord told His disciples, “All ye shall be offended because of me this night” (Matt. 26:31), Peter disobediently contradicted Him. He also exalted himself above the others, saying that even if everyone else were offended, he would not be (Matt. 26:33). Because he had been beguiled into arrogance, he fell further than the rest, so that by humbling himself more than them he might eventually appear more radiant. Unlike Adam who was tempted, vanquished and completely brought down, Peter, having been tempted and led astray a little, overcame the tempter. How? Through his immediate condemnation of himself, his intense sorrow and repentance, and the medicine which brings forgiveness, tears. “A heart that is broken and humbled”, it says, “God will not despise” (Ps. 50:17), and “Godly sorrow worketh repentance to salvation not to be repented of” (2 Cor. 7:10), and “They that sow” their supplications “with tears shall reap” forgiveness “with rejoicing” (cf. Ps. 125:6). 6. Anyone who looks at Peter will see that through repentance and painful grief he not only adequately healed the denial into which he had been drawn, but he also completely rooted out of his soul that passion which had made him fall behind the others. Wishing to demonstrate this to everyone, the Lord, after His passion in the flesh for our sake and His rising on the third day, used those words to Peter which we read in today’s Gospel [for Orthros], asking him, “Simon, son of Jonah, lovest thou Me more than these” (John 21:15), meaning, “more than these disciples of mine”. But see how much humbler he has become. Whereas before, even without being asked, he set himself above the rest and said that even if all forsook the Lord, he would not; now; on being asked whether he loves Him more than the others do, he affirms that he loves Him, but leaves out the word “more”, saying “Yea, Lord; Thou knowest that I love Thee” (John 21:15,16, cf. 17). 7. What does the Lord do? Since Peter has shown that he has not lost his love for Him and has now acquired humility as well, He openly fulfils the promise made long before and tells him, “Feed My lambs”(John 21:15). When He was referring to the company of believers as a building, He promised to make Peter the foundation stone, saying, “Thou art Peter, and upon this rock I will build My church” (Matt. 16:18). On the other hand, when He was talking in terms of fishing, He made him a fisher of men with the words, “From henceforth thou shalt catch men” (Luke 5:10). But when He speaks of His disciples as sheep, He sets Peter over them as a shepherd, saying, “Feed My lambs, feed My sheep” (John 21:15-17). It is clear from this that the Lord’s desire for us to be saved is so great, that He asks of those who love Him only one thing: to lead us to the pasture and fold of salvation. 8. Let us long to be saved, and obey those who lead us in that direction through their words and deeds. As long as each of us wishes to take the road leading to salvation, the teacher, prepared by our common Saviour, is at hand, together with the giver of salvation, who, in His overwhelming love for mankind, is more than ready without being called or beseeched. Christ asks Peter three times so that three times he can reply affirming his faith, thus healing his threefold denial with his threefold confession. Thrice Christ appoints him over His sheep and lambs, placing under him the three categories of those being saved: slaves, hirelings and sons, or, alternatively, virgins, chaste widows and those honourably married. But when Peter was asked again and again if he loved Christ, the Scripture tells us he was grieved by the repeated questioning (John 21:17), supposing that the Lord did not believe him. Knowing that he loved Christ, aware that his questioner knew him better than he knew himself, and feeling under pressure, Peter not only confessed that he loved Him, but also proclaimed that the Lord he loved was “God over all” (Rom. 9:5), by saying, “Lord, Thou knowest all things; Thou knowest that I love Thee”, because only “God Who is over all” is all-knowing. 9. Once Peter had made this heartfelt confession, the Lord ordained him shepherd and chief pastor of His whole Church, and also promised to encompass him with such strength, that he who previously was unable even to stand being spoken to and questioned by a young girl (John 18:17), would endure unto death, even death on a cross. “Verily, verily, I say unto thee, When thou wast younger”, both physically and spiritually, “thou girdest thyself”, meaning, thou didst use thine own strength, “and walkest whither thou wouldest”, doing what thou didst like and living according to thy natural inclinations. “But when thou shalt be old”, having reached the peak of thy physical and spiritual age, “thou shalt stretch forth thy hands”. With these words, Christ indicates that Peter will die on a cross, and bears witness that his crucifixion will not be involuntary. “Thou shalt stretch forth thy hands, and another shall gird thee”, meaning strengthen, “and carry thee whither thou wouldest not”, that is to say, out of this life (cf. John 21:18). Our nature is unwilling to be dissolved in death, and Peter’s superhuman martyrdom also demon­strates our attitude as human beings to life. “Strengthened by Me”, Christ tells him, “thou wilt willingly endure all these things for My sake and bear witness to Me; for the desire to do so is not natural but supernatural to human nature”. 10. Peter was the sort of man who can be described in a few words. As for Paul, on the other hand, what tongue - or how many and what sort of tongues - can depict even to a limited extent his endurance unto death for Christ’s sake? He was put to death every day, or rather he was always dead, no longer alive himself, as he tells us, but having Christ living in him (Gal. 2:20). For love of Christ he not only counted everything in the present world as dung (Phil. 3:8), but even put things to come in second place compared to the Lord. “For I am persuaded”, he says, “that neither death, nor life, nor things present, nor things to come, nor height, nor depth shall be able to separate us from the love of God which is in Christ Jesus our Lord” (cf. Rom. 8:38-39). He had zeal for God, and was jealous over us with divine jealousy (2 Cor. 11:2). The only one to equal him in this was Peter, but hear how humble he is when he says of himself, “I am the least of the apostles, that am not meet to be called an apostle” (1 Cor. 15:9). 11. Given that Paul made the same confession of faith as Peter, and had the same zeal, humility and love, surely they received the same rewards from Him who measures everything with completely just scales, yardstick and plumbline. Anything else would be unrea­sonable. That is why the Lord told Peter, “Thou art Peter and upon this rock I will build My church” (Matt. 16:18), whereas He said to Ananias of Paul, “He is a chosen vessel unto Me, to bear My name before the Gentiles and kings” (Acts 9:15). Which name? Clearly the name we have been given, the name of Christ’s Church, which rests on the foundation stone of Peter. Notice that Peter and Paul are equal in prominence and glory; and both hold up the Church. Consequently the Church now bestows one and the same honour on both, and celebrates them together with equal esteem. As we consider the outcome of their lives, let us imitate how they lived, or at least how they were restored through humility and repentance, even if we cannot attain to their other great and exalted achievements, which are appropriate to great men and fitting for great men to emulate. In fact, some aspects of their lives are probably impossible for anyone to imitate. Amendment through repentance, however, is more appro­priate for us than for the great, since we all sin many times every day; and unless we lay hold of salvation through continuous repentance, we have no hope of it from any other source. 12. Repentance is preceded by awareness of our sins, which is a strong incentive to mercy. “Have mercy on me”, said the psalmist and prophet to God, “for I know mine iniquities” (Ps. 50:1, 3). Through his recognition of sin he attracted God’s compassion, and through his confession and self-condemnation he obtained complete forgiveness. “I said”, the psalmist tells us, “I will confess mine iniquities before the Lord against myself. And Thou forgavest the ungodliness of my heart” (Ps. 31:5), because acknowledgment of our sins is followed by condemnation of ourselves, which in turn is followed by that sorrow for our sins which Paul calls “godly sorrow” (2 Cor. 7:10). After godly sorrow confession and prayer to God with a contrite heart come naturally (cf. Ps. 50:17), as does the promise to keep away from evil from now on. This is repentance. 13. 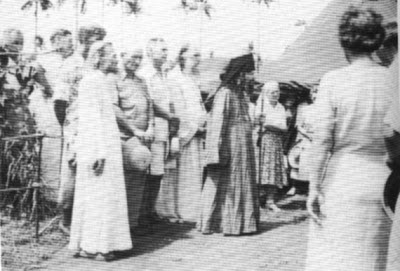 This is how Manasseh escaped being punished for his sins, even though he had fallen into many great and serious transgres­sions, and wallowed in them for years on end (2 Chr. 33:1-20). As for David, the Lord set aside his sin because of his repentance, nor did he deprive him of his prophetic gift. When Peter resorted to repent­ance, he not only recovered from his fall and obtained forgiveness, but was also appointed to protect Christ’s Church. As you see, Paul too was rewarded with this role after his conversion, once he had made progress and become more closely God’s own than the others. Repentance which is true and truly from the heart persuades the penitent not to sin any more, not to mix with corrupt people, and not to gape in curiosity at evil pleasures, but to despise things present, cling to things to come, struggle against passions, seek after virtues, be self-controlled in every respect, keep vigil with prayers to God, and shun dishonest gain. It convinces him to be merciful to those who wrong him, gracious to those who ask something of him, ready with all his heart to bend down and help in any way he can, whether by words, actions or money, all who seek his assistance, that through kindness to his fellow-man he might gain God’s love in return for loving his neighbour, draw the divine favour to himself, and attain to eternal mercy and God’s everlasting blessing and grace. "Holiness is not simply righteousness, for which the righteous merit the enjoyment of blessedness in the Kingdom of God, but rather such a height of righteousness that men are filled with the grace of God to the extent that it flows from them upon those who associate with them. Great is their blessedness; it proceeds from personal experience of the Glory of God. Being filled also with love for men, which proceeds from love of God, they are responsive to men’s needs, and upon their supplication they appear also as intercessors and defenders for them before God." In trying to resettle his flock, Vladika went to Washington, and through his intervention, almost the whole camp was miraculously able to come to America - including his orphanage. 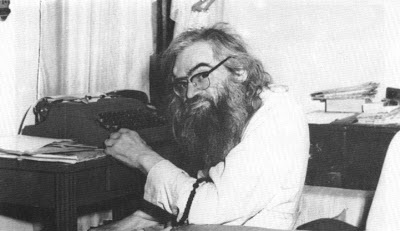 In 1951 Vladika was sent to Western Europe. 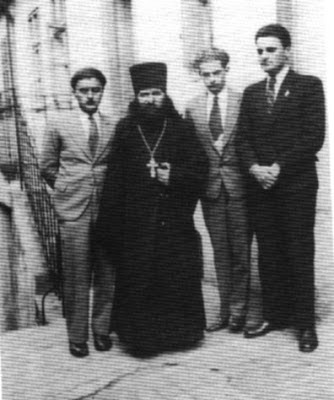 Here too his reputation for holiness spread - and not only among the Orthodox. In one of the Catholic churches of Paris, a priest strove to inspire his young people with these words: “you demand proofs, you say that now there are neither miracles nor saints. Why should I give you theoretical proofs, when today there walks in the streets of Paris a saint - Saint Jean Nu-Pieds (St. John the Barefoot)”. Note: Please see the wonderful site of the Joy of All Who Sorrow Cathedral, for more information on St. John including service texts and miracles. 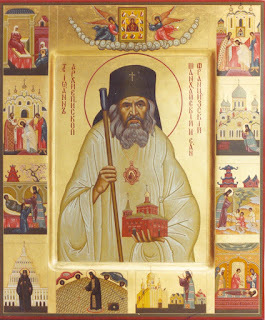 On this site, one can submit names online to be prayed for before the Holy Relics of the Saint, one can request Holy Oil of the Saint, and one can make a donation. There are services which occur every morning and night, and the wonderworking Relics of St. John can be venerated at such times. This is a great blessing and treasure for the faithful of America. May St. John, who is such a great wonderworker of our days, bless, protect, and heal all of those who need his help throughout the world. Lo, Thy care for thy flock in its sojourn / prefigured the supplication which thou dost ever offer up for the whole world. 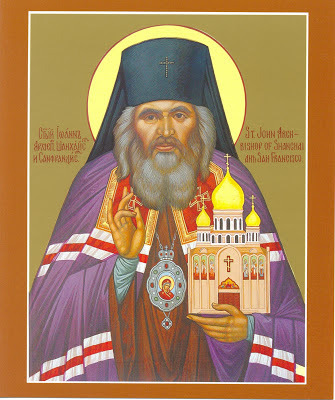 / Thus do we believe, having come to know thy love, O holy hierarch and wonderworker John. / Wholly sanctified by God through the ministry of the all-pure Mysteries / and thyself ever strengthened thereby,/ thou didst hasten to the suffering, O most gladsome Healer, // Hasten now also to the aid of us who honor thee with all our heart. Thy heart hath gone out to all who entreat thee with love, O holy hierarch John,/ and who remember the struggle of thy whole industrious life,/ and thy painless and easy repose,// O faithful servant of the all-pure Directress. 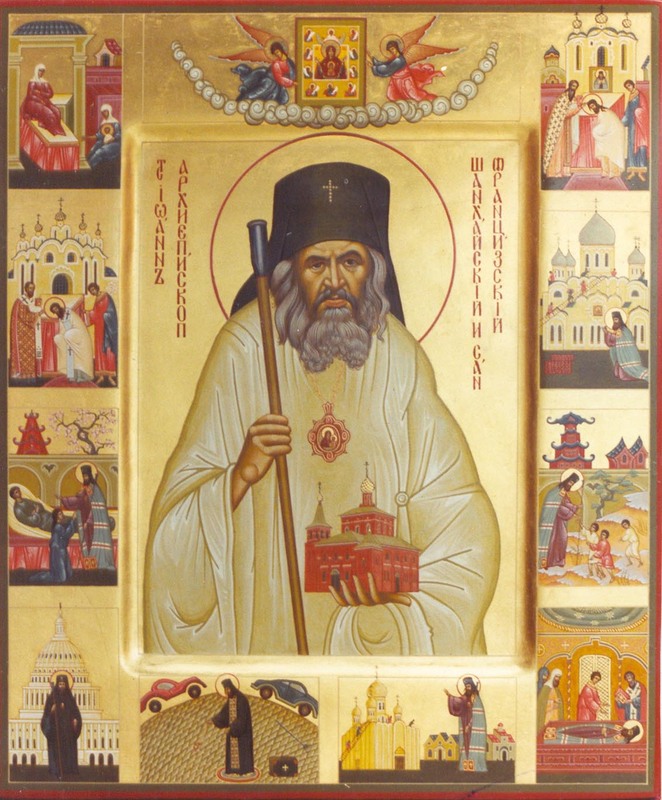 Glorious apostle to an age of coldness and unbelief,/ invested with the grace-filled power of the saints of old,/ divinely illumined seer of heavenly mysteries,/ feeder of orphans, hope of the hopeless,/ thou didst enkindle on earth the fire of love for Christ/ upon the dark eve of the day of judgement.// Pray now that this sacred flame/ may also rise from our hearts. Chosen wonderworker and superb servant of Christ/ who pourest out in the latter times/ inexhaustible streams of inspiration and multitude of miracles,/ we praise thee with love and call out to thee:/ Rejoice, holy Hierarch John, wonderworker of the latter times.